MicroRNAs (miRNAs) are a class of single-stranded RNAs, 18-23 nucleotides in length that regulate gene expression at the post-transcriptional level. Dysregulation of miRNAs has been closely associated with the development of cancer. In the process of tumorigenesis, mammalian target of rapamycin (mTOR) plays important roles, and the mTOR signaling pathway is aberrant in various types of human cancers, including non-small cell lung cancer (NSCLC), breast cancer, prostate cancer, as well as others. However, the relationship between miRNAs and the mTOR signaling pathway is indistinct. Herein, we not only summarize the progress of miRNAs and the mTOR signaling pathway in cancers, but also highlight their role in the diagnosis and treatment in the clinic. Cancer is one of the most prevalent causes of morbidity and mortality worldwide[1-3]. In China, the cancer mortality rate is slightly higher and has been continuously increasing in recent years. The development of cancers involves several signaling pathways, such as mammalian target of rapamycin (mTOR), nuclear factor kappa B (NF-κB), mitogen activated kinase-like protein (MAPK) to name a few. Specifically, the mTOR signaling pathway plays an important role in cancer cell proliferation, cell cycle and apoptosis. Through binding to mRNAs' 3'-untranslated region (3'-UTR), miRNAs cause degradation of mRNAs or inhibition of protein translation. As a kind of proto-oncogenes or anti-oncogenes, they can affect the development of cancer directly or indirectly. The progress of the miRNA and mTOR signal pathways have been continuously reported in recent years[6-8]. Herein, we focus on the impact of miRNAs on the mTOR signaling pathway in cancer. Dysregulation of the serine/threonine protein kinase mTOR is linked to tumorgenesis. The mTOR complex includes two parts, mTOR complex 1 (mTORC1) and mTOR complex 2 (mTORC2). Multiproteins comprise mTORC1, including mTOR, regulatory protein associated with mTOR (raptor), and mammalian lethal with Sec13 protein 8 (mLST8). Three core components compose mTORC2, namely mTOR, rapamycin insensitive companion of mTOR (Rictor), and mLST8. mTOR belongs to the PI3K-related kinase (PIKK) family. Activated by stress, energy, amino acids, DNA damage, or growth factors, AKT serine/threonine kinase (AKT) or RAS proto-oncogene (Ras) stimulate mTORC1 indirectly. This process eventually enables mTORC1 to further affect proliferation, cell growth, and autophagy. On the contrary, the anti-oncogene phosphatase and tensin homology deleted on chromosome 10 (PTEN), TSC complex subunit 1 (TSC1), and TSC complex subunit 2 (TSC2) can inhibit the progress of the mTOR pathway. Moreover, Phosphatidylinositol-4,5-bisphosphate 3-kinase (PI3K) activates Phosphatidylinositol-3,4,5-trisphosphate (PIP3) and promotes its translation into Phosphatidylinositol-4,5-bisphosphate (PIP2), which in turn, promotes mTORC2, finally promoting proliferation (Figure 1). Through targeting genes directly or indirectly, miRNAs are involved in mTORC1 and further influence cell phenotype, including proliferation, metastasis, cell cycle and apoptosis[11-15] (Figure 2). By downregulating the expression of mTOR, miR-199a can inhibit the proliferation of liver cancer, endometrial cancer, and glioma[16, 17]. Likewise, miR-205 can promote the proliferation of NSCLC by downregulating the expression of PTEN, which is related to the mTOR signaling pathway. The apoptosis of oral squamous cell carcinoma is promoted by miR-218 through the inhibition of the phosphorylation of AKT, a key member of the mTOR signaling pathway. Additionally, miR-101 can inhibit development of carcinoma through indirectly upregulating PTEN. The mTOR signaling pathway. 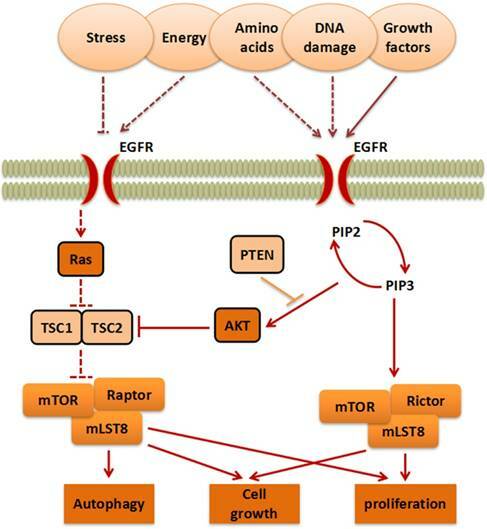 The signaling pathways contain mTORC1 and mTORC2, which are activated by stress, energy, amino acids, DNA damage, and growth factors, to further influence cell growth, autophagy and proliferation. Additionally, miR-22 can inhibit the metastasis of renal cell carcinoma via galectin-1 (Gal-1), playing a novel role in mTOR signaling pathway. miR-204 can act as an anti-oncogene by targeting mTOR in breast cancer and ovarian cancer. As an important oncogene in the mTOR signaling pathway, mTOR can also be upregulated by miR-451 and thus promote the metastasis of colon cancer. Furthermore, miR-15a and miR-16 can promote drug chemosensitivity in human cervical carcinoma through inducing autophagy, which has a close relationship to the mTOR signaling pathway. As a result, miRNAs can indirectly inhibit tumorgenesis in part through the enhancement of autophagy. However, contrary to miR-376b, miR-129 can promote the process of glioma by autophagy through promoting the mTOR signaling pathway indirectly. There is still debate surrounding the mechanism of autophagy in cancer cells. It is possible that there is a threshold where autophagy can inhibit cancer development, but otherwise promotes oncogenic progression[26, 27]. miRNAs can influence different cancers via regulating the mTORC2 pathway. miR-153 can act as a potential suppressor factor, which has a vital role in glioma cancer cells. Overexpression of miR-153 can cause significant inhibition of cell growth and activetion of apoptosis via targeting mTORC2. Furthermore, in cervical cancer cells, miR-218 enhances apoptosis and impedes cell cycle through reducing the expression of Rictor[31, 32]. In contrast, miR-21 can promote cell invasion through the induction of mTORC2 expression in renal cancer cells. It has been demonstrated that miR-218 could accelerate bone loss through downregulation of Rictor expression. Lin-4 and let-7 contribute to inter-tissue transport through the promotion of the mTORC2 pathway[35, 36] (Table 1). The close relationship between miRNAs and lung cancer has been confirmed by several studies[4, 55-59]. miRNAs can act within the mTOR signaling pathway by regulating multiple target genes. 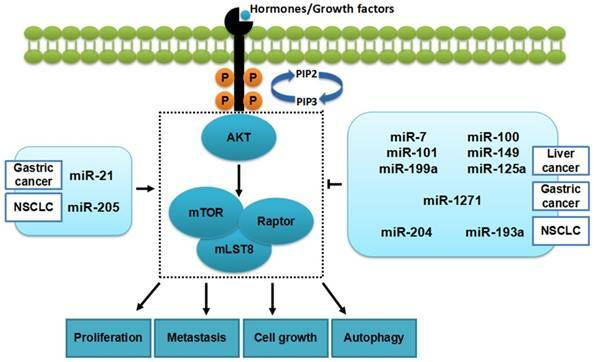 Through downregulating the expression of PTEN, a vital anti-oncogene in the mTOR signaling pathway, miR-10a can promote the proliferation of cancer. miR-503 can inhibit the proliferation of NSCLC by downregulating the expression of phosphoinositide-3-kinase regulatory subunit 1 (p85), and therefore plays an important role in mTOR signaling pathway. Through the suppression of cyclin dependent kinase inhibitor 1A (p21), a significant factor of mTOR signaling pathway, miR-208a can promote the process of NSCLC. miR-31 can suppress the process of NSCLC through inhibiting the expression of MET proto-oncogene, receptor tyrosine kinase (MET), which is related to the mTOR signaling pathway. The relationship between miR-32 and mTOR has already gained much attention. miR-32 can promote proliferation and metastasis of hepatocellular carcinoma cells through directly targeting PTEN. miRNAs and mTORC1 in cancers. Some miRNAs (in the table 1) can inhibit tumorigenesis in cancers by regulating mTORC1 while, others promote the development of cancers. As a vital regulator of the mTOR signaling pathway, epidermal growth factor receptor (EGFR) has a significant influence on the pathway itself and other cancers[65-68]. EGFR could activate the mTOR signaling pathway through growth factors or other factors (Figure 1). We proved that miR-107-5p and miR-34a could directly target EGFR to further inhibit cell proliferation, restrain metastasis, impede cell cycle, and promote apoptosis in vitro, furthermore, they could inhibit proliferation by directly targeting EGFR in vivo[69, 70]. miR-34a also has been found to inhibit proliferation of cancer cells through downregulating AKT in glioma stem cells. Breast cancer is a malignant disease affecting females worldwide, and has attracted more and more attention over the years[4, 72]. The cell cycle of breast cancer can be impeded by miR-100, and its apoptosis promoted through the downregulation of the mTOR signaling pathway[73, 74]. Furthermore, miR-125b can inhibit the expression of mTOR, thus inhibiting the process of breast cancer. Moreover, reducing drug resistance in breast cancer plays a positive role in treatment. Other studies have also confirmed the inhibitory effect of miR-15, miR-16, and miR-99a in breast cancer[76-78]. 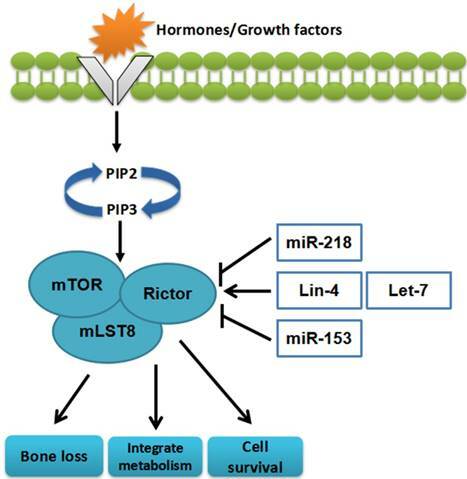 Moreover, miR-25a and miR-25b can inhibit the migration of prostate cancer through directly targeting la ribonucleoprotein domain family member 1 (LARP1), which is related to mTOR. In prostate cancer, miR-29b has been found to inhibit cancer development by downregulating mTOR signaling. Males diagnosed with prostate cancer have a high rate of morbidity and mortality. We speculate that this disease could be one step closer to being overcome through investigating the relationship between miRNAs and the mTOR pathway in prostate cancer. miRNAs influence tumorigenesis in a diverse subset of cancers via the mTOR pathway, including hepatocellular carcinoma (HCC). Overexpression of miR-1207-5p exhibited a negative regulatory function on HCC through suppressing the expression of the mTOR pathway. Besides, other groups have proved that miR-345, miR-221, and miR-223 could inhibit the development of HCC by mediating the mTOR pathway[82-84]. A decrease in drug resistance can be achieved through miR-130a, miR-100 and miR-199a's modulation of the expression of the mTOR pathway in ovarian cancer[85-87]. In gastric cancer, miR-224 can promote the development of cell growth and metastasis through activation of the mTOR pathway[88, 89]. Inversely, miR-370 could inhibit tumorgenesis by restraining the mTOR pathway of gastric cancer cells[90, 91]. Studies have also demonstrated that miRNAs could downregulate the expression of the mTOR pathway to inhibit the invasion and migration of colorectal cancer cells[92-94]. As known to all, the serine/ threonine kinase B-Raf (BRAF), a proto-oncogene, has a close relationship with the mTOR pathway[95-97]. BRAF plays an important role as a therapeutic target in the treatment of melanoma. Studies have shown that miR-146b, miR-302, and miR-378-5p can impede the development of cancer through binding to the 3'-UTR of BRAF, which provides a new avenue for targeted therapy[99-102]. More studies are needed to expand upon and detail the therapeutic target genes of the mTOR signaling pathway that are stimulated by miRNAs. In conclusion, miRNAs can, on the one hand, influence the proliferation, metastasis, apoptosis, and cell cycle of different cancer cells through targeting the mTOR signaling pathway. On the other hand, miRNAs are known to reach phase Ⅰ clinical trials, importantly acting as a cancer diagnosis index[103, 104]. Moreover, some miRNAs can be combined with other non-coding RNAs to inhibit tumor progress and development. Precision medicine has drawn more and more attention recently as an elegant and effective approach to battling this serious and widespread disease. Our lab has demonstrated that the miRNAs, miR-34a, miR-107-5p, miR-18a-5p, miR-146a-5p, miR-32, miR-181a-5p, and miR-486-5p have important functions in the progress of lung cancer[69, 106-111]. In NSCLC cells, miR-34a, miR-107-5p, and miR-146-5p function as suppressors by targeting the oncogenic genes, transforming growth factor beta receptor 2 (TGFβR2), EGFR, and cyclin D1 (CCND1)/cyclin D2 (CCND2) respectively, resulting in the inhibition of proliferation, metastasis, and cell cycle and promoting apoptosis[69, 106, 111]. While we found that miR-18a-5p and miR-150 act as oncogenic factors, increasing proliferation and cell cycle, we also found that miR-18a-5p promotes autophagy[108, 112]. In addition, we demonstrated that miR-32a can inhibit proliferation, cell cycle, and promote apoptosis, that miR-181a-5p restrains cell proliferation and migration in NSCLC, and that miR-486-5p is a negative regulator of NSCLC through inhibiting cell growth and impeding cell cycle[107, 109, 110]. These miRNAs are related to the tumorigenesis of NSCLC and can become molecular diagnostic tools in the treatment of lung cancer. In patients, the mTOR signaling pathway is linked to a poor prognosis. As a result, it exposes a new possible target for the diagnosis and treatment of cancer[113, 114]. Some miRNAs, such as miR-16, have been in drug development and have been tested for safety and activity in patients who suffer from recurrent malignant pleural mesothelioma. Furthermore, miR-34a could become the first miRNA to reach phase Ⅰ clinical trials. Moreover, some microRNAs can be regarded as diagnosis markers for cancer[116-118]. In recent years, new types of non-coding RNA, such as tRNA-derived small RNA (tRF) and circular RNA (circRNA), have been identified in diverse cancers and confirmed to play an import role in tumorigenesis. Therefore, we believe there is a network of non-coding RNA regulating cell progress. What's more, non-coding RNA could have an important role in cancer stem cells. Last but not least, personalized medicine catered to each patient will be advocated for the treatment of cancer in the future. There is no doubt that the study of miRNAs or the mTOR signaling pathway will arouse increasing attention.